Lanterns are an essential piece of equipment to take camping or to use in emergencies when the power is out to provide light. LED lanterns are preferred because they last practically forever and you will not need to replace a bulb. The perfect choice is one that is bright enough to read by, but that also provides a lower output of a nice soft glow for ambient light especially for tent use. Battery options vary with most using D cell batteries, but some use AA or even lithium rechargeable batteries. Also be aware of the size – many are now very small, but some are larger than you think and take up a lot of space if you are backpacking or camping. Prices range from about $25-$90 with plenty of good models in the lower price range. Below you can read our top 5 best LED lantern reviews. We also have a lantern spec comparison chart at the bottom of this article to easily compare each model. 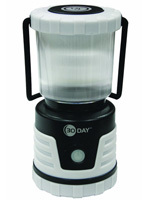 Our pick for the best LED lantern is the Ultimate Survival Technologies 30-Day Duro Lantern which sells for about $33. It has earned high praise from many reviewers including being named the best by thesweethome.com, earning an editors choice award from Popular Mechanics, and receiving a 4.6 star rating from users on Amazon. Powered by 3 D cell batteries it puts out an extremely bright 300 lumens on high and can last 30 days on the low setting which outputs a nice soft glow of 30 lumens which is perfect for tents. That light output is as good as you can get in a lantern as small as this one – 3.5 x 3.5 x 7.25 inches tall and weighs just 1 pound. There really are no weaknesses on the UST 30-Day Duro, so we highly recommend it. We feel you should only look for another model if you want different features such as rechargeable batteries or a USB port for recharging your phone. The highest rated LED lantern we could find on Amazon is the $33 Streamlight 44931 Siege 540 Lantern with a 4.8 star average rating from over 2000 reviewers. 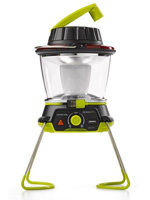 This rugged lantern is powered by 3 D batteries that provide up to 30 hours of run-time on the brightest 540 lumen setting or up to 295 hours in the dimmest 55 lumen setting. In addition to three brightness settings, there is a unique red LED function which outputs 10 lumens of red light which lets you preserve your night vision. 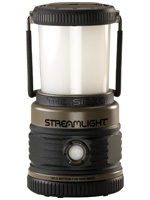 The Streamlight 44931 also has D-rings incorporated into the top and bottom of the lantern so you can hang it upright or inverted. About the only complaints we have are its weight compared to other models (31 ounces) and the lowest setting is still a bit brighter than other model’s lowest setting. Those are really minor problems and overall the Streamlight 44931 Siege 540 Lantern is outstanding and we highly recommend it. 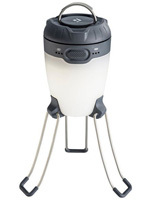 The recently updated Black Diamond Apollo received an Editor’s Choice award for OutdoorGearLab.com for LED lanterns and is available for about $56. It now runs on an internal rechargeable 2600mAh Li-ion battery or by 3 AA batteries to give you up to 150 hours of use on the dimmest setting (10 lumens) or 24 hours on the brightest (250 lumens). You can also recharge your phone via the external USB port. Although it is not the brightest lantern, the Black Diamond Apollo scored high marks for its size, versatility, and durability. It weighs in at just 12.1 ounces with the 3 AA batteries and comes with a dimmer switch and battery life indicator. It has a unique tripod-like design with 3 rubber-tipped legs that make it easy to setup on uneven surfaces. It also has 2 opposing metal hooks which allows you to securely hang it from just about anything. If you need super bright light then the Apollo might not be for you, but we do recommend it for anyone who just needs ambient campsite light. The $80 Goal Zero Lighthouse 400 is a great choice for a LED Lantern if you don’t want to use disposable batteries. It has a 4400mAh lithium battery which can be recharged from a USB cable, a hand crank, or a solar panel (not included). One minute of cranking can provide up to 10 minutes of light. Unfortunately with a fully charged battery you will only get 2.5 hours of run-time on the full 400 lumen highest setting, but there are 6 different levels you can set it to with the lowest giving you 48 hours of run-time. The Lighthouse 400 has legs and a hanger to stand it up or hang, plus it can also recharge your electronic devices like your phone or tablet through a USB cable. It weighs 1.1 pounds with dimensions of 6 x 4.5 x 5 inches. One other negative to the Goal Zero Lighthouse 400 is its proprietary 18650 battery which means if you ever need to replace the battery you have to buy the Goal Zero version, instead of a generic 18650 battery. We don’t recommend this Goal Zero model for everyone, but if you want a rechargeable battery then this one is for you. 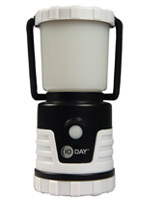 The UST 10-Day Duro is the little brother of the 30-Day and is the cheapest LED lantern on our list at just under $28. It uses 6 AA batteries and will last a minimum of 26 hours on high and 255 hours or 10 days on low. It is about the size of a pop can so it is a great choice for anyone who needs to save space like backpackers. Despite its diminutive size it still puts out about 250 lumens on high which is bright enough for most situations, and 21 lumens on low. Overall this Ultimate Survival Technologies 10-Day Duro is a great choice for anyone concerned with price or size.